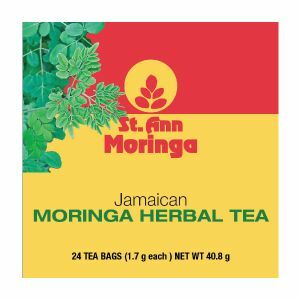 St. Ann Moringa produce the most natural, high quality and healthy Moringa, straight from their farms in St Ann Jamaica. They're passionate about what They do and wish to share our wonderfully tasting and hugely beneficial Moringa with you. St. Ann Moringa is 100% Natural with nothing added and nothing taken away. It is grown without the use of fertilizers or pesticides and no GM contamination. The leaves are washed and then dried naturally away from direct sunlight in order to preserve the vitamin content. For maximum benefit drink 2 or 3 cups of Moringa Tea a day. Bring the water to boil then let it rest for a minute then pour onto the tea bag and let it draw for a few more minutes then drink.